Something amazing happened on Friday, March 16, 2018, for a group of business owners in Nashville. They were taking part in one of the 24 Essential Business Skills trainings that every business owner needs to know. Today’s training was how they could take action with their Business Finances and get a better understanding of how to prepare for future growth. 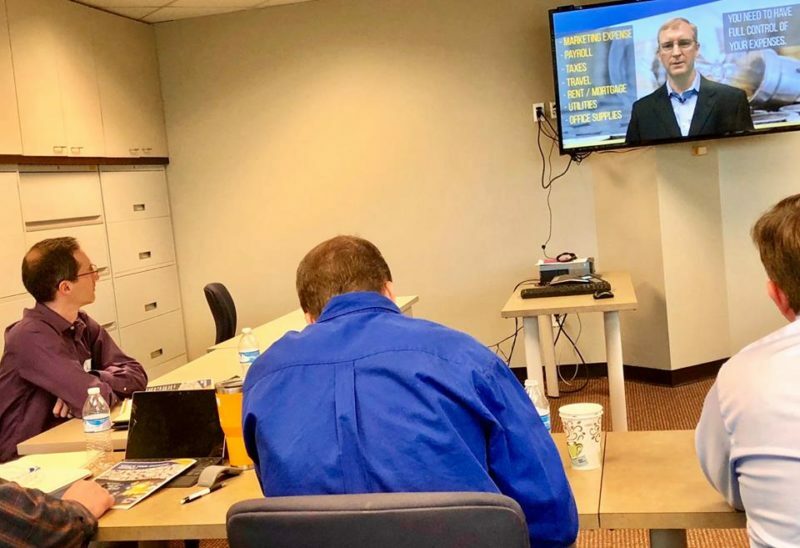 This half-day Catalyst Group™ Training Program was delivered and taught by a business finance expert in Atlanta, while the group worked with a Catalyst Group™ Program chair and a business advisor in Nashville. This two-pronged approach leads right into the reasons High Achievers® is one of the fastest growing business coaching companies in the world. We used our cloud-based technology to deliver training from a business finances expert to a group in a separate city. Our technology first approach allows us to get the right group with the right expert anywhere in the world. Because the trainings use the ABEL™ principle, Action Based Experiential Learning, the business owners, working with the business advisor and chair, helped each of them create an actionable plan before they left. They will use these plans to tackle some of their most significant financial challenges. High Achiever® believes in the idea of “No Coach” which means that we are not going to fill you with platitudes and warm feelings. We want our clients empowered with real action plans and, using our cloud-based membership portal, work with accountability partners. Every time we work with business owners, we are doing everything possible to help them embrace A Lifestyle of High Achievement™. The Catalyst Program™ at High Achievers® is split into two significant parts to help small business owners get the most out of their small business coaching experience. We have a Catalyst Group™ Training Program which our team of business coaching experts has developed and organized into a two-year schedule. The 24 Essentials of Small Business Training will help you with the skills you need to be successful in your business. There are so many skills needed in today’s small business world. This program can fill any holes that you may have in your skill set and help you brush up on the skills you already have. The second part of our Catalyst Program™ is our Mastermind Groups. We understand that some small business owners need a peer to peer mastermind group to help them get the support and accountability that they need to achieve their goals. Our Mastermind Groups are set up to max out at 12-15 members and have industry-specific seats to protect your ideas as they are developed inside the Mastermind Group. Each Mastermind Group has a Catalyst™ chairperson who is a local business coach or advisor. In this group, on a monthly basis, you will focus on the significant challenges the individual members face as well as gratitude and accountability. Taking the 24 Essentials of Small Business Training for a year on a month by month basis. The training for each month are set at the beginning of the year. Making a one-year commitment to the 24 Essentials of Small Business Training at a discount. Working with a Mastermind Group with a year’s commitment. Utilizing our full Catalyst program combining both the Catalyst 24 Essentials of Small Business Training and the Mastermind Program. This is a year’s commitment with a significant discount and a complimentary two months at the end of the term. If you are looking for the perfect solution for your small business needs, the Catalyst Group™ can help you move to the next level. Please feel free to contact us about the upcoming Catalyst Discovery™ event in your area or engage with us live online. Both of these options will enable you can gain a better understanding of where your company is now and if using a business coaching program is right for you. You can sign up for the next event here. If you would like to have a short conversation with one of our Catalyst team members, please email us at askaboutacoach@highachievers.com or call us at 678.888.0202.